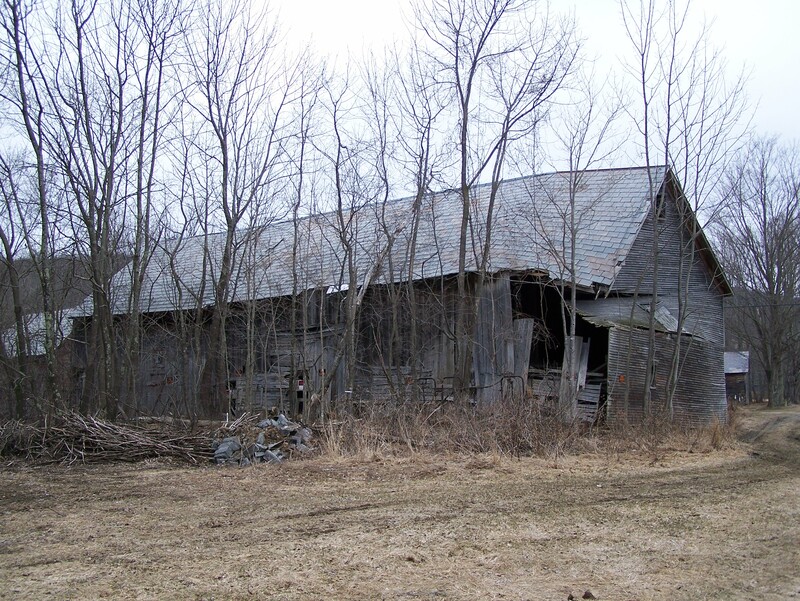 Controlled Collapse of Ira Barn – on video! Remember the old Ira Barn we have oft-written about? 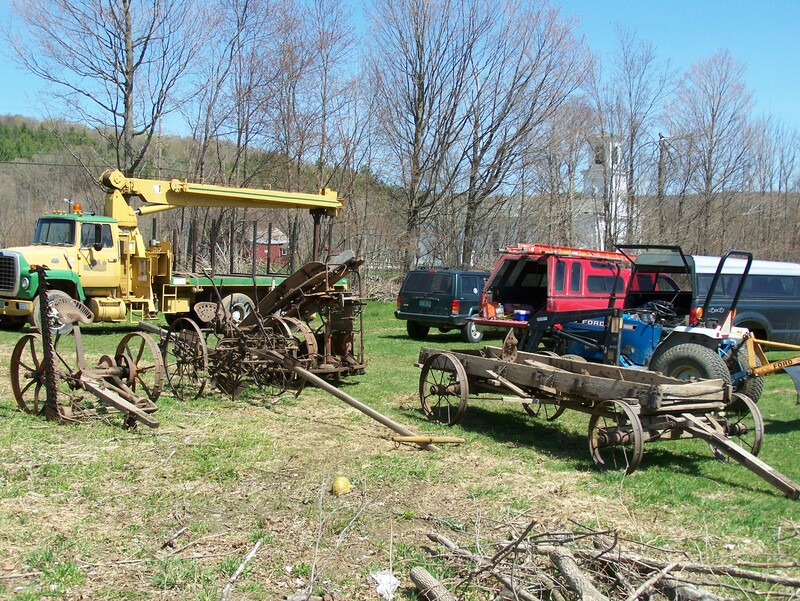 The original barn had three parts: the main frame we wrote about earlier, a 32-foot frame that we are currently working on dismantling, and a third, 14-foot timbered section on the far end that was not salvageable. Below is a picture of the old timber frame – to help jog your memory! While this isn’t our usual MO here at Green Mountain Timber Frames, it was too dangerous to dismantle this small section by hand so we organized a controlled demolition. In my over 30 years of experience in timber framing, I have never before done this kind of demolition before. In this case, however, the safety concerns warranted this more dramatic approach. We first salvaged material from the failing section of the barn. 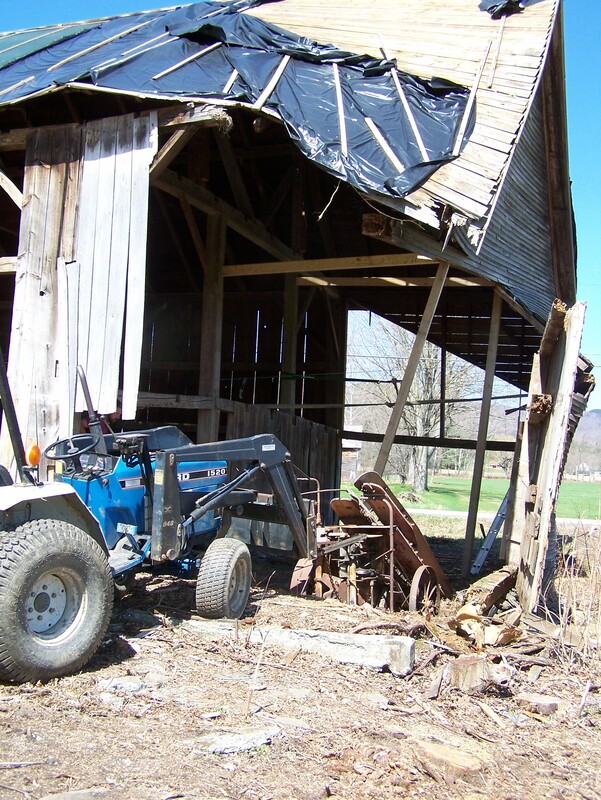 In the picture below, you can see us using a tractor to remove equipment from the barn before the controlled collapse. We then used a block and tackle, a maple tree and four chains in order to do the demolition of the small timbered gable end section. We captured the whole thing on video! You can view it below, or on our new Green Mountain Timber Frames YouTube Channel! This entry was posted in Green Mountain Timber Frames, Post and Beam, Timber Frame Projects, Timber Frame Videos and tagged barn demolition, controlled demolition, Green Mountain Timber Frames, historic barn, historic post and beam homes, timber frame videos, Vermont timber frame, vermont timber frames, vermont timberframe by Green Mountain Timber Frames. Bookmark the permalink.